Below you will find the exercises and solutions available for The Language of Mathematics. Over time, more will be added and those in draft form will be finalized. Please keep in mind that like most people, I am prone to making silly mistakes, so take the answers with a grain of salt. Corrections and suggestions are always welcome. Series I - Description, Videos. Series II - Description, Videos. Series IIIa - Description, Videos. Series IIIb - Description, Videos. Exercises: Which number set do the following numbers belong to. Exercises: Break down the following into their Prime factors. iii) Adding and Subtracting Fractions. Exercises: Find the missing variables, and solve the following right triangles. ii) Congruent and Similar Triangles. ii) Finding Slope, Midpoint, and Distance of a Line. iib) Finding Distance of a Line. - No exercises available for this series at the moment. In much the same manner that the industrial revolution brought about a surge of literacy in natural languages, the advent of the Internet in combination with low-cost computing has brought about a surge in the need to be literate in the language of mathematics. Due to these advancements, math has become an integral part of our society and the need to be literate in this language a necessity. There are, however, some major problems. Many education systems across the globe are under stress and failing. The causes are vast and varied, so we’ll refrain from discussing the details of this collapse but instead focus on possible solutions to our predicament. It is my belief that access to a good education is a human right, an obligatory gift from one generation to the next, and as long as we have access to an open, unfiltered, and uncensored Internet, then we, as a global community, can make a difference. We can fill the gap left behind by our governments and institutions by becoming proactive educators. For my part, I will try and show how beautiful, how powerful, how useful and how easy it is to learn the bare minimum we need to know about the language of mathematics to enhance our lives. To achieve this task I am producing instructional videos for all major topics covered in secondary school math curriculums in Canada and the United State, i.e., all major topics starting with The Real Number Set up to and including an introductory course in Calculus and one for Probability and Statistics. Content is being presented in an online video text book format and organized into two main Tables of Contents: One geared towards teaching the rules and principles that we use in math, and the other geared towards applying this information in real life. This is the essence of this site, teaching The Language of Mathematics to those who want to use Math in Real Life. 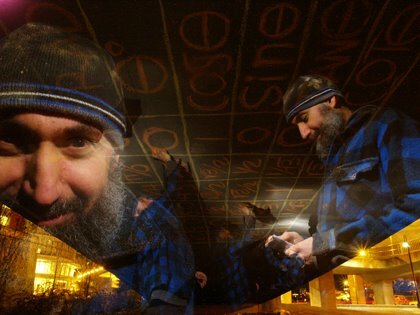 As for how you can support this project: It takes a tremendous amount of time and energy to produce this work, so, if you enjoy this work, if you are finding the information on this site useful, and if you would like to support this project, and can afford it, then please consider making a donation. From the series, "Shots in the Dark" by Jonathan Dy. The Language of Mathematics is geared towards teaching the syntax of this language, the rules and principles that we use in math. This project began in 2007 with The Real Number Set and will conclude with an introductory series on Calculus and one for Probability and Statistics. Math in Real Life, started in 2012, is in its infancy and will continue indefinitely. The content in this section is geared towards using The Language of Mathematics to enhance our lives. 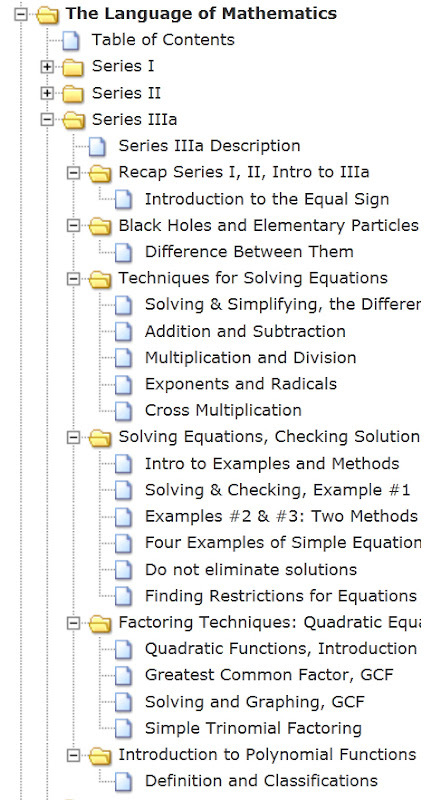 Lessons are also accessible through the tree menu provided in the left column. Specific topics can be found through the Index (left column). This erroneous perception of math’s practical usage has been the most prevalent problem in our education system, and by addressing it, the beauty of mathematics and its relevance reveals itself. Information gets absorbed faster. The details get scrutinized and people begin to recognize the occasions for which they have, can, and are already using math in their own lives. This is the ultimate purpose of this section, to apply what we have learned from studying The Language of Mathematics to enhance our lives. The first part of this series deals with the absolute basics of mathematics: the Real Number Set; basic operations; prime numbers and their importance; and how to deal with fractions. This is where it all begins. Please be comfortable with this material before moving on. In addition to the above, we take a rudimentary look at Zero and Infinity, and Why Two Negatives Make a Positive. Full list and links for all the videos contained in the series are provided below and are available at: Table of Contents: The Language of Mathematics - Series I. Exercises and Solutions are also available for this series. Formulas and definitions used in this series (Direct link to full album. Four images total). 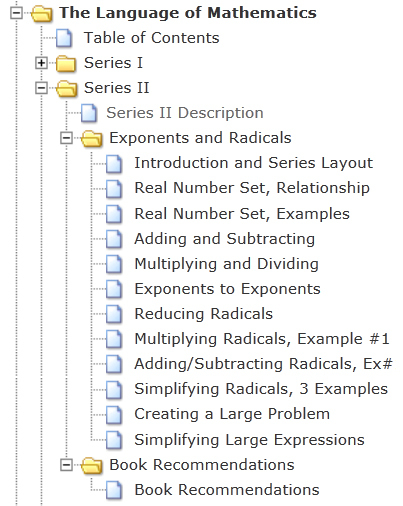 This series is all about exponents and radicals: how to add, subtract, multiply, and divide them; how to take a power to a power; and the process involved for simplifying radicals and large expressions. We also take a detailed look at how exponents and radicals are related to the Real Number Set. Please note that the videos for this part of the series have overlaps. Videos #40 and #41 discuss the importance of the subsets of the Real Number Set and how they translate over to the basic operations for exponents and radicals. The information contained in these two videos is repeated in videos #42-44, with the addition of examples. If you are familiar and comfortable with the basic operations for exponents and radicals, then videos #40 and #41 should suffice. If you would like the information to be presented with examples, then it will be worth your while to view the latter set. See Video #39 for more information on how the material is being presented. In addition to the above, five book recommendations. Full list and links for all the videos contained in the series are provided below and are available at: Table of Contents: The Language of Mathematics - Series II. In this series we learn different techniques for solving equations, combine and isolate variables, talk about the equal sign, how to move around an equation, discuss the graphical meaning for solving equations, learn about restrictions, and how we would go about checking solutions. Also included is an introduction to polynomial equations and functions, a discussion of their classifications, and factoring techniques, beginning with the Greatest Common Factor (GCF) and Simple Trinomial Factoring (Factoring techniques for polynomials is continued in Series IIIb). In addition to the above, we also take a brief look at the difference between black holes and elementary particles. Full list and links for all the videos contained in the series are provided below and are available at:Table of Contents: The Language of Mathematics - Series IIIa.